Here are some of the accents I'd like to add to the shelves! 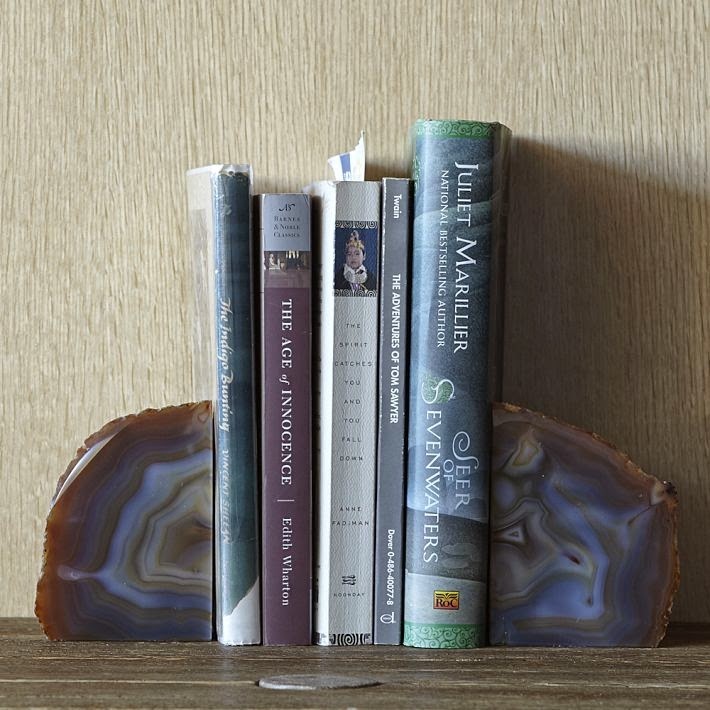 These beautiful West Elm bookends. The set is only $36 which isn't bad at all! 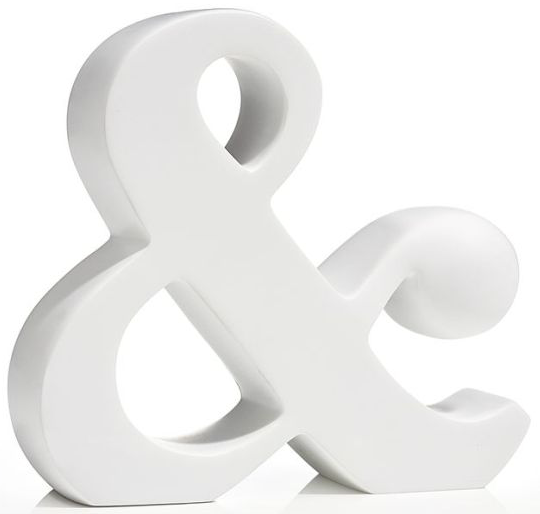 Super cute Ampersand from Barnes & Noble - I also really like this lucite monogrammed letter and this Ampersand from Target. A few of these coffee table books stacked in a pretty fashion! I'm thinking some of these mentioned above, along with a small vase, some photos and our current items will make this look good! Where do you like to shop for home decor? 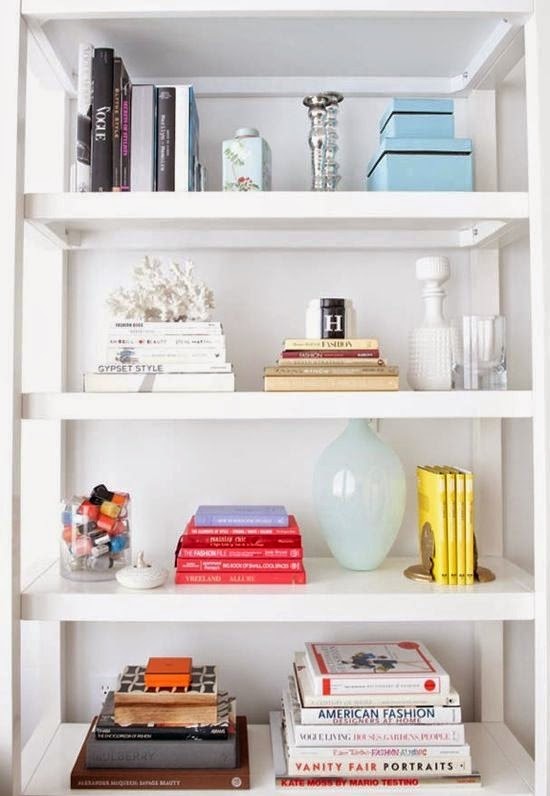 How would style shelves like these? Ugh loving all of this! I love the bookshelf with the pretty back drop. I need to spruce up my bookshelf too!! OOooh I love this post! Those shelves are awesome! Love all those inspiration pics. I am a big fan of the turquoise foo dogs. I got a pair on amazon recently. They look great on my ikea shelves. I also found this really cute mini gold buddha on ebay to hopefully bring us some good luck! I love the color grouped books. The white coral pieces and the ampersand is amazing! Can't wait to see when you are all finished. Some framed prints would look really good. Or a black and white striped vase. XO! 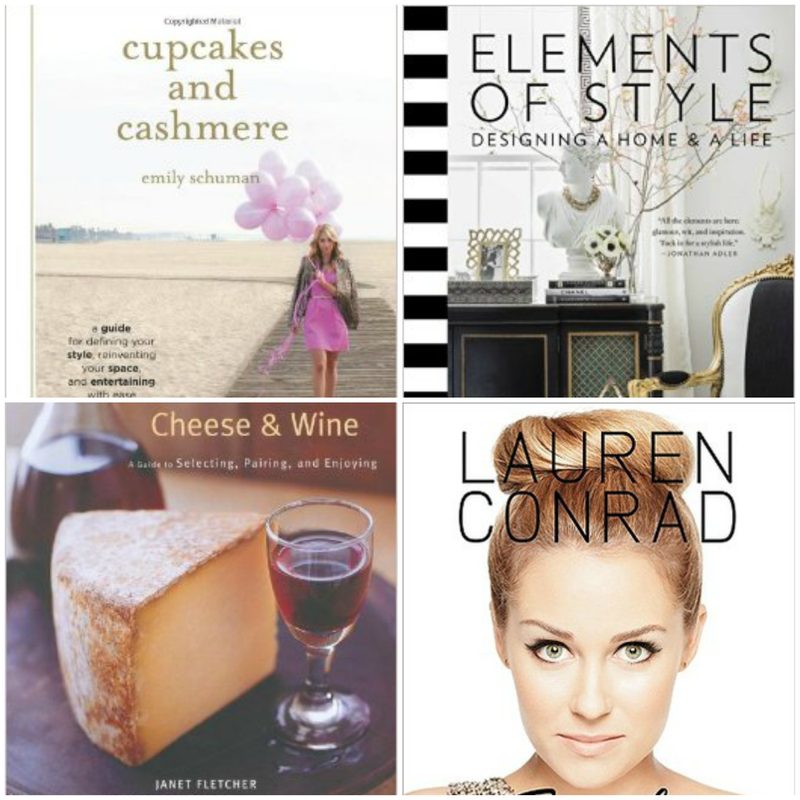 Oh and do you have the Cupcakes and Cashmere book? I was wondering if it was good or not. One of my absolute favorite decorating/coffee table books is Thom Filicia "Style". It has great advice and inspiration and perfect paint color recommendations. He designed Giuliana and Bill's first Condo and it was gorgeous! It just has so many good ideas and you can really learn a lot from it! I'm loving your inspiration and can't wait to see how you accessorize the shelves, I find it to be so hard to decorate & accessorize them. I have 4 empty shelves in my entertainment cabinet that I keep departing what to do! I'm sure whatever you do, will be very pretty! Great inspiration pictures, I love that each one incorporated an element of plant life. The mix of functional storage as well as one signature pop of color, or white accents. Styling shelves is harder than it looks! Love the items you picked and love your leaning shelves. Can't wait to see the end result! I absolutely love this! I'm a big fan of wallpaper/scrapbook paper/whatever lining the back of bookshelves - I hope to do that with ours once we find our new home. You have such a great sense of style and home decor, so I'm sure your shelves will be spruced up in no time! love all the pinsperation pics!! check homegoods and marshalls. seriously i saw the west elm book ends things in my marshalls for about 10 bucks each. they weren't a set but you'd have to get two of them!! My mom keeps on buying me all these entertaining and coffee table books and Mark continues to ask where there are going to go. Hello! It will be for when we have a chic bookcase and we can stylishly arrange it! 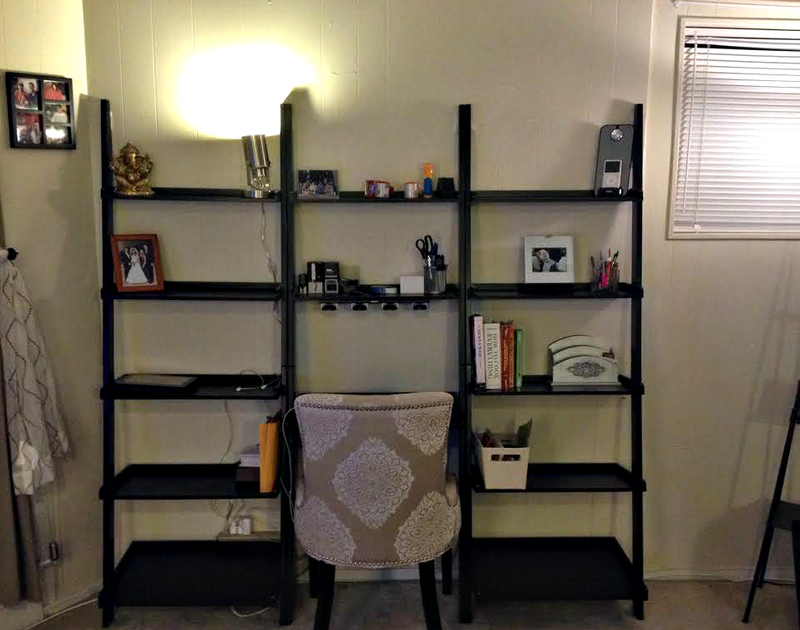 We used to have bookshelves in our living room, and I was so overwhelmed with styling them, that I had my husband move them to the garage! I can't wait to see the finished product! 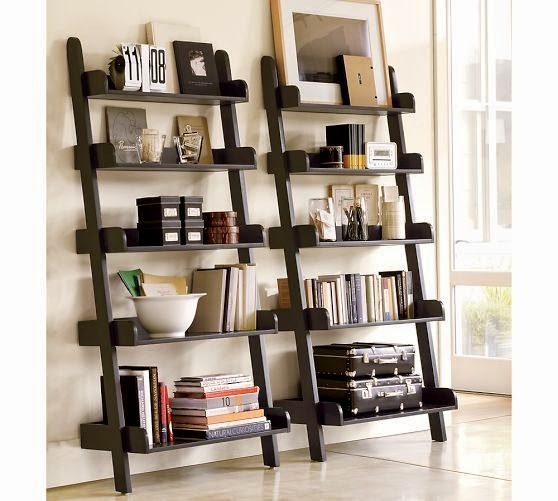 Sigh, I love a good a good bookcase, so pretty and so sleek! Love the one you have and the thoughts for updating it! can't wait to see the final product. ooh i love your chair. i keep meaning to buy a bookshelf... my cookbooks need a home! shelves are the hardest thing for me. I love the look of the 'pinteresty' ones but we just have so many books its not practical. I would love to have several shelves around my house so that i can split the books up and have more fun stuff, and really its KC - he has way more books than me (mine are at home) and he likes to keep them all together and doesnt understand my need for pretty. that being said - the first inspiration picture - swoon. obsessed. they actually look a lot like our shelves, apart from the backing. 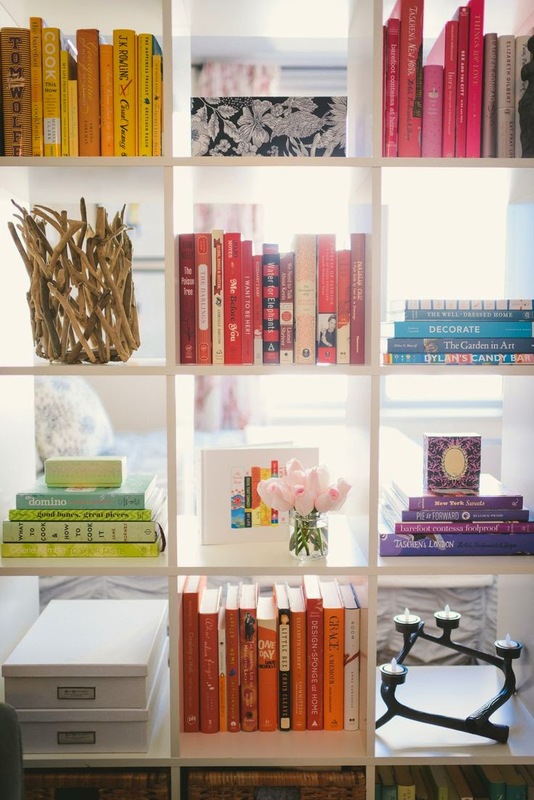 inspiration #7 i see a gorgeous copy of pride & prejudice (bottom right corner) the yellow one, yes i am obsessed. i love those clothbound classics, so pretty. AND i love the ampersands as well, but i just feel like they are everywhere right now! i would love to do our letters and an ampersand on the wall or something, but we both start with K so it's a bit boring lol. K&K. boo. Anywho, I have picked up a lot of my home decor at Home Goods, Target, Yard Sales + Goodwill / Salvos. So cute!! I love decorating shelves! I always find such amazing things at Homegoods for that! I've always wanted a beautiful bookshelf display in my home, everything you shared is beautiful! I love bookcases!! I have four in my house and just love to rearrange them. Yours looks great!! i want that ampersand--it's my fave symbol! I love the leaning bookshelves & all of your inspiration. I say fill them with books, haha :) We only have one pretty small bookshelf, that annoyingly is overflowing, so any attempt I had at organizing or decorating it was lost to books being shoved in, in every which way! That white bookshelf with the black design is adorbs. Hobby Lobby is where I got most of my accessories for the millions of shelves in the house. Loving their different sized letters and symbols they have right now. Im needing some nice coffee table books in my living room! Nice choices. yes yes and yes to all of the inspiration choices- how can we roll them into one?? 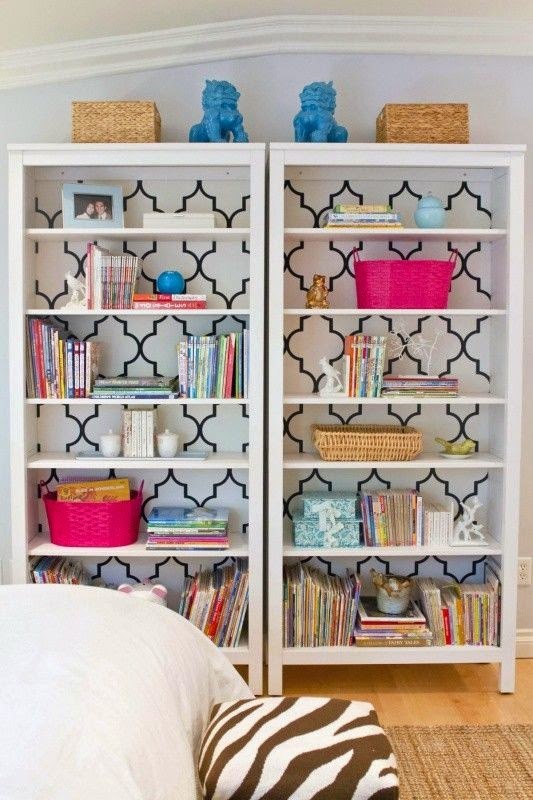 I love the idea of lining book shelves with patterned paper, etc. gives it a fab pop! I'm on the hunt for more storage shelves & desk right now... never can get enough! I love all of your inspiration, so pretty! It makes me want to shelves like this just so I can decorate them! Can't wait to see your finished product! I've always loved those leaning shelves. I definitely want one for my office at home but need to find an affordable set. I love those leaning book shelves and I've always wanted some. I'm also recently obsessed with those Ikea book shelves. I'd take any of them if i had the room. I can't wait to have a house one day so I can have all of these things :) Love the inspirations you are finding. Check out Amazon and of course TJ and Ross, et cetera for knick knacks to use as filler. 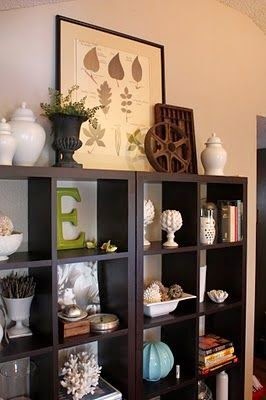 Love the look of the stenciling behind the shelves! I finally arranged books by color in our guest room and it looks as good as you hope so it's always an easy decor fix! I love the "&" it never gets old. Neither do anchors! I shop for home stuff at Homegoods, TJ Maxx, Marshall's, West Elm and Z Gallery. Styling shelves is always fun, but so hard to decide which route you are going...and the placement of everything once you get it! Check out Goodwill-seriously. You can do the color organizing with random cheap books easily. Also, if they have accessories you like but you hate the color you can always spray paint them! That shelf with the background is gorgeous! and I love the ampersand! I think you're on the right track! Target, Homegoods, Marshalls, onekingslane.com, and etsy are the suggestions I have for finding unique things to style them with. i love that pattern background in that first pinterest picture! i am just now getting into pattern matching for clothing, but i think in a house it's just as pretty! Oh how I love a good bookshelf. Mine are styled mostly with books (because I have too many to even count, ack!) candles (I hoard them, it's fine), photos, and all the little things people give as gifts — little figurines, an antique teapot from my grandmother, hand-carved things from my grandfather and brother, and then other more useful things like some decorative antique platters and a cake plate, since I have a studio now and such minimal kitchen storage. I always check the aisles of Target for little accents and Homegoods is a great source for me too, but I generally try to avoid having stuff just for the sake of stuff and work with what I already have and need to find a new home for! I always love your picks, especially that first one with the pattern back! I'm having the same dilemma with shelves in my living room. It's expensive and requires a lot of time to fill and decorate those things! I love those shelves! Are they the Crate and Barrel ones? I also am a big fan of the ampersand for decor! Target has had so many cute ones this past year! They keep bringing them back in different colors and styles! Coffee table books are also key and maybe a small basket for remotes, etc? Ugh, Pinterest always makes us feel like we aren't decorating right lol. Love all of this inspiration and you are so right, a few good books and some flowers is always simple perfection. Can't wait to see the end result! oh pinterest you always have me wishing and hoping for a cuter looking home!! I like the wallpaper background on that one shelf... that's cute!!!!! I swear, how do people perfectly style book shelves like that?? I try to do something similar and it always falls so short!! 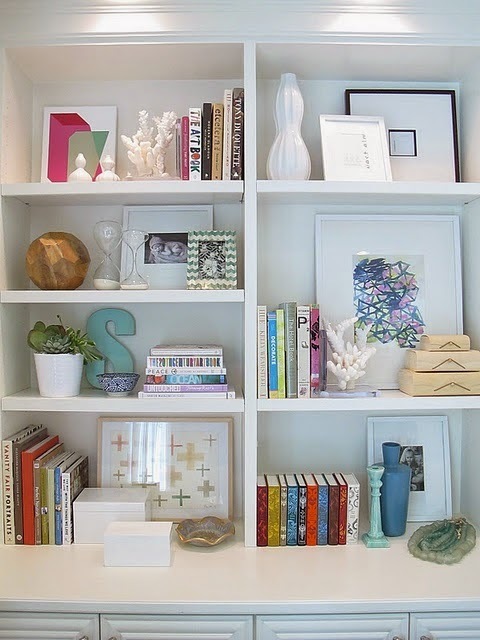 Love the mix of books, frames, and vases... I also love the giant letters. I typically get most of my home decor from Target (so many cartwheel deals! ), Bed, Bath, & Beyond, Kohls, and Overstock/Wayfair. That gives you so much space to work with! Ah I can't wait to see what you style it with! Such great inspiration pics; I can't wait to see how you style them! I always find great things at places like Home Goods, TJ Maxx, and Marshalls (of course!). I love redecorating my shelves! I go to TJ Maxx and home goods for most of the pretties!! Target always has some over priced item I can't live with out as well! oh I LOVE your leaning shelves! I need to get on decorating shelves and I'm actually kind of excited about it haha! Loving that first one with the white and the Moroccan wallpaper in the background...and also the rainbow books in the other! Love these shelving options- can't wait to see how yours turn out! :) Redecorating totally gives new life to a space! Oh, bookshelf/coffee table styling is so much fun! Looks like you have it taken care of girly!! I really like the ladder-shelf look! And I LOVE LOVE LOVE the color-coordinated stacks of books! Oh, and one more thing...adore your desk chair! Cupcakes and Cashmere has a section in her book about styling shelves and I generally follow her "rules." I redid the shelves in our family room and receive a ton of compliments on them. Isn't it fun to redecorate? I wish I could do it all day long! I love bookshelves/cubes that have everything so strategically placed.. love those pinspirations and can't wait to see the final product!! Do you live right in the city? When we visited, we booked a vacation rental and stayed in a 1 bedroom apt in the north end. It was perfect for our stay, but then we imagined trying to fit all of our crap in there and actually living there! So small! It amazes me how creative people get with adding storage to their home! I feel like styling bookshelves look SO easy on Pinterest, but when you actually have to go out and buy stuff for those shelves, it becomes overwhelming! Good luck with it! You have some gorgeous inspiration photos. Gosh don't you just wish that every single one of those inspirations would magically appear in your house?!? So pretty!! I love all the inspiration! A good bookcase does so much for a room!!! I love all of the inspiration! Especially photo # 2!